The German carrier pledges the EU Commission to concede no more traffic rights to Emirates, Qatar and Etihad Airways if they do not stop their alleged market distorting strategies. In their latest LHG policy brief the airline advocates a review of traffic rights should the Gulf carriers fail to terminate their cut-throat competition which is enabled by billions of state subsidies. 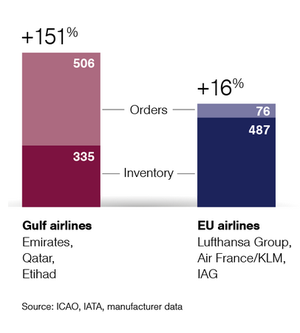 The latest accusations are the fiercest ever published by Lufthansa against their Gulf rivals. Obviously, the carrier that has come under massive external pressure by aggressive competitors but also through internal controversies with bullheaded pilots and other groups has decided to step up the political pressure, urging the EU Commission and the Berlin government to ensure a level playing field in international air traffic. According to data, passenger flows between Germany and the UAE increased only by 4 percent during the last 10 years. That’s exactly the capacity by which Lufthansa expanded their roundtrips between both countries. In contrast, EK and EY increased their number of seats three to fourfold. While only a minority of travelers chose the UAE as a final destination, 3.1 million passengers from Germany transit at either Dubai or Abu Dhabi annually to catch connecting flights. The situation is similar in cargo, with transits dominating the flow there as well. The policy brief is completely in line with complaints recently tabled by Delta, American and United over alleged unfair practices by the three Arabian airlines. In their initiative called “Let’s Restore Fairness to Open Skies” the big 3 speak of “huge trade violations” executed by the Gulf trio, empowered by huge state subsidies. The seats on Emirates’ A380 roundtrips Dubai-Dallas are only booked to 38% on average; seen as critical by the 3 U.S. airlines. But state granted $2.4 billion to compensate fuel hedging losses, government airport infrastructure subsidies of $2.3 billion in connection with $2.2 billion stemming from third party transactions enable EK to up the fleet constantly and operate loss-making routes to secure its growth to the detriment of its commercial competitors. Lufthansa concludes that the bilateral treaty signed by Germany and the UAE, based on fair and balanced competition has largely been repealed by the 3 Arabian airlines. It’s time that Brussels and Berlin take action to stop the abuse, concludes the carrier.